Less than a week after it released iOS 8.3 to the general public, Apple released iOS 8.4 beta to registered developers. The new firmware brings a redesigned Music application to the Cupertino giant’s mobile platform. 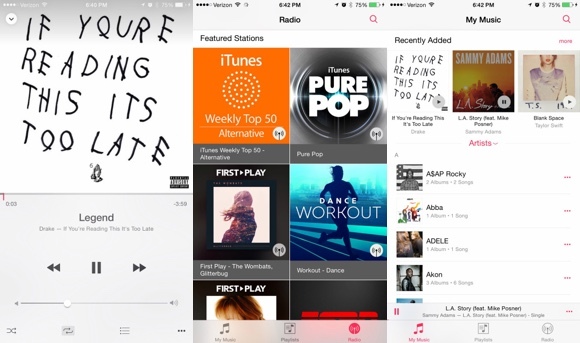 The new Music app for iOS features an all-new, sleeker design, as well as MiniPlayer feature. The latter allows you to control playback while browsing to your music collection. Recently added albums and playlists now appear on top of the user’s music library. Discovering music via iTunes Radio has also been made easier via hand-curated and featured stations. The app’s Now Playing interface has been overhauled with larger artwork. Users can also see what song from their library is coming next. Finally, the new Music for iOS has a Global Search option. It allows users to search for songs and iTunes Radio stations from anywhere within the app. 8.3 make switching between apps faster. I think it make reloading background apps faster hence the overall speed.